Gondola End Cap End Display | E System Sales, Inc. 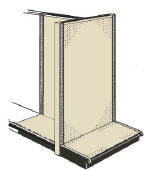 The End Panels with Radius Corners are used to close off the ends of Gondola/Wall runs. They add a trimmed look to the runs. 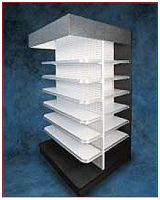 Requires finish codes for both exterior and interior panel material. The End Panels with Square Corners are used to close off the ends of Gondola/Wall runs. They add a trimmed look to the runs. Requires finish codes for both exterior and interior panel material. Edge work matches the exterior finish unless optional T-Mold is ordered. 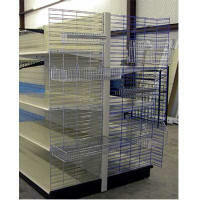 The Gondola Wire Display Panel provides a valuable merchandising space at the end of Gondola/Wall runs. 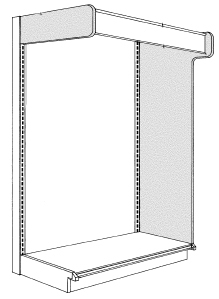 This panel connects into the Gondola/Wall Basic Upright on one side and attaches securely to the side of the shelves on the opposite side. This wire display panel utilizes a multi-purpose grid pattern which allows the use of slatwall accessories, peg hooks and 3" o.c. wire grid accessories. The Gondola Wire Display Panels are sold in pairs, one left hand and one right hand. 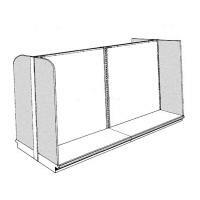 Canopies can be created on either a Gondola Island aisle or a Wall aisle using a standard upper shelf directly mounting a wooden type canopy that is actually 2 pieces of firmly mounted together with two types of canopy ends available. 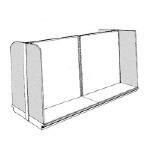 Double sided half gondola section sits flush against a gondola section to create an attractive and affordable end cap.